What is a PTC site? Paid To Click (“PTC”) Websites act as middlemen between advertisers (Advertisement-sponsors) and consumers (Advertisement-viewers). The sponsor pays for website-displays on the PTC sites and a part of this payment goes to the consumer, when he views the advertisement. In order to make money at PTC-Sites, you only have to click on the advertisements and visit the sponsored website for usually 3 to 60 seconds (depends on the value of each ad). The amount per ad ranges from $0.001 and up to $0.02 If a PTC will promise you more per click, be aware it could probably be a scam website. To be able to earn money on PTC Sites you need to become a member by signing up into these sites. Which are the best Paid To Click sites? 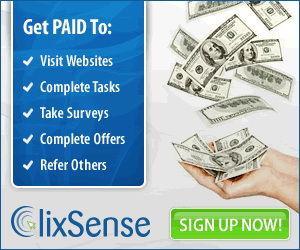 ClixSense and Neobux are the best and most trusted Paid to Click Websites in the PTC-industry. ClixSense is online and paying since 2007, Neobux since 2008. This entry was posted in FAQ by admin. Bookmark the permalink. When and how will I get paid (Cashout)? Copyright © 2019 best-paid-to-click-sites.org. All Rights Reserved.